The business card below popped up on a friends wall on Facebook. It’s a card with attitude and the story behind how it ended up in the press can be read at The Best Business Card Ever: A Warren Buffett Story, Starring His Girl Friday, Devon Spurgeon. 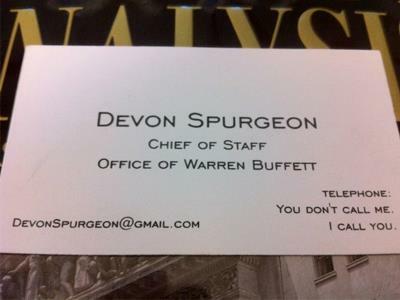 The Huffington Post wrote about it too at Devon Spurgeon, Warren Buffett’s Chief Of Staff, Keeps Hilarious Business Card: ‘You Don’t Call Me. I Call You’. For some occasions that kind of card can be useful but using a Gmail address is a bit generic. I, for fun, bought the domain youdontcallme-icallyou.com which carries the message in a different way. Posted on September 2, 2011 by BengtPosted in Bits and piecesTagged Creativity.